Marshall senior wideout Tyre Brady (8) stretches the ball inside the pylon and beyond the goal line for a first quarter touchdown on Saturday during a 32-16 victory over Eastern Kentucky in a non-conference gridiron contest at Joan C. Edwards Stadium in Huntington, W.Va.
HUNTINGTON, W.Va. — An ugly football win is still a beautiful thing. 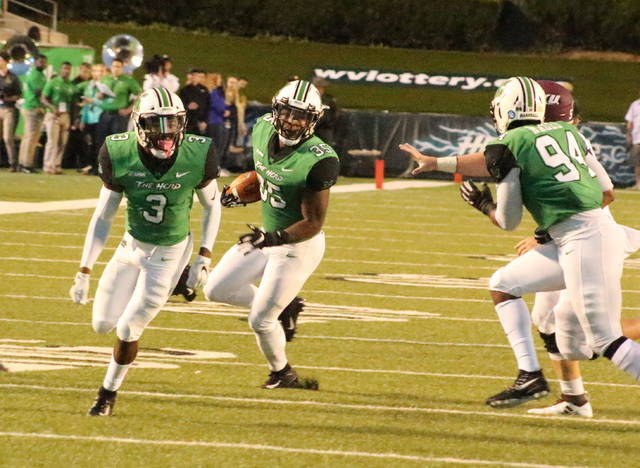 Marshall committed four turnovers, had a pair of special teams kicks blocked and struggled to pull away from visiting Eastern Kentucky until the fourth quarter on Saturday during a 32-16 victory in the 2018 home opener at Joan C. Edwards in Cabell County. 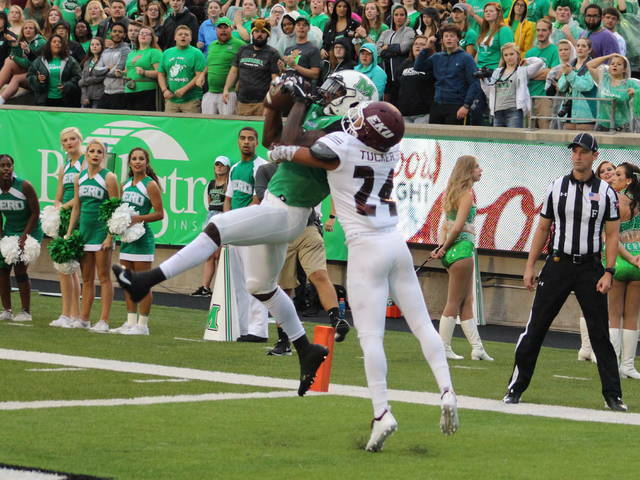 The Thundering Herd (2-0) had three special teams gaffes and an interception that repeatedly gave the Colonels (1-1) great field position, which ultimately allowed the FCS-level program to yield all 16 of its points from those miscues. Nonetheless, the Green and White led wire-to-wire after storming out to leads of 13-0 and 20-6 after each of the first two quarters — then led by at least one possession the rest of the way. Despite the miscues, MU still finished the evening plus-1 in turnover differential after forcing five takeaways that resulted in 13 points. The hosts also outgained the Maroon and White by a 367-187 margin in total yards of offense while notching their eighth consecutive home-opening triumph. 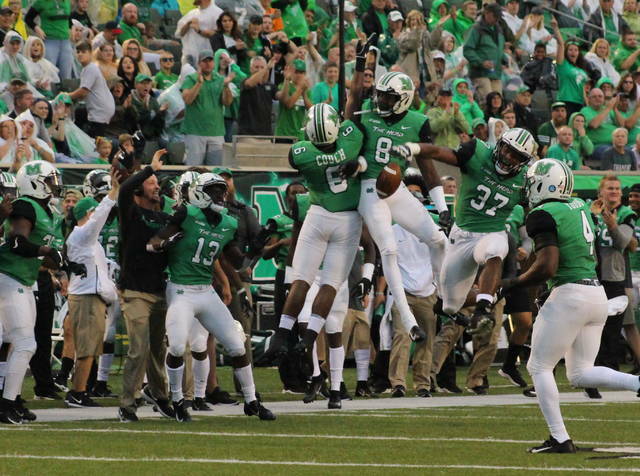 Marshall head coach Doc Holliday felt that Saturday’s performance wasn’t even close to perfect, but it was sufficient enough to get the Herd where they wanted to be by night’s end. And, as the ninth-year MU mentor noted afterwards, the defensive unit did a real nice job of constantly bailing the team out of trouble. EKU had consecutive possessions at the start of the game after its first drive resulted in a punt that ran up the back of the leg of Marshall blocker. The Colonels recovered at the MU 37, but the ensuing drive stalled and another punt gave the hosts possession at their own six. The Green and White covered 94 yards in a dozen plays, with Obi Obialo hauling in a 20-yard touchdown pass from Isaiah Green on a lob in the left corner of the end zone. Obialo’s score came with 4:28 left in the first, but the extra-point kick was blocked — making it a 6-0 contest. The Colonels committed their first miscue on their very next offensive snap as Brandon Drayton picked off an Austin Scott pass, giving the hosts possession at the EKU 38. The Herd needed six plays to cover that distance, with Green finding Tyre Brady on a six-yard catch-and-run that saw Brady stretch the ball just inside the pylon for the score. Justin Rohrwasser tacked on the extra-point boot, allowing Marshall to extend its lead out to 13-0 with 1:14 remaining in the opening canto. The hosts forced consecutive punts on Eastern Kentucky’s next two possessions, but the second punt bounced off of a MU blocker’s helmet during the downfield process. The guests fell on the live ball, taking over on downs at the Marshall 19 with 12:21 left until halftime. L.J. Scott capped a three-play, 19-yard drive by plunging in on a seven-yard run at the 10:41 mark for a 13-6 deficit. Both teams traded punts, then the Colonels came away with an interception on a ball that hit Brady before bouncing into the hands of Leodis Moore. EKU, however, turned right around and gave the ball back as Scott was picked off by Frankie Hernandez — giving the hosts a first-and-goal at the five. Tyler King went up the middle untouched on the very next snap, allowing the Green and White to extend their lead out to 20-6 with 4:38 remaining in the half. 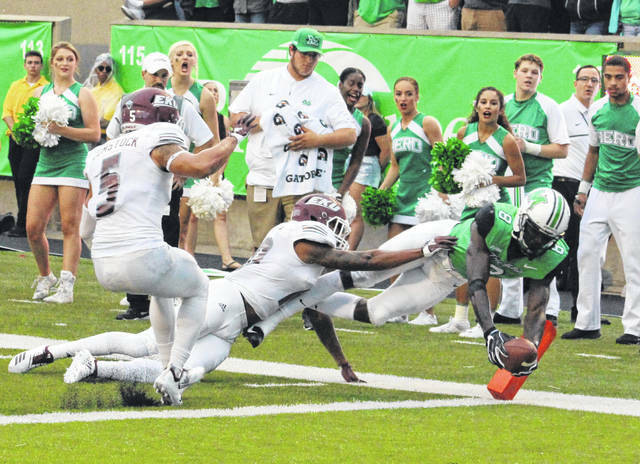 Marshall fumbled the opening kickoff of the second half, and the Maroon and White scooped up the miscue while taking over on downs at the MU 30. Five plays later, Eastern Kentucky was once again back to within a possession as Alonzo Booth capped things with a seven-yard run at the 12:28 mark of the third for a 20-13 contest. The Colonels, however, were never closer the rest of the way. MU answered with a five-play, 55-yard drive that ended with a 40-yard pass from Green to Obialo with 10:49 left in the third for a 27-13 advantage. Rohrwasser — who was 3-for-4 on extra-point kicks — nailed a 35-yard field goal to give Marshall its largest lead of the night of 30-13 with 7:27 left in regulation. The Colonels completed their scoring with a 29-yard field goal from Sam Hayworth at the 4:19 mark. Malik Thompson sacked Dakota Allen in the end zone with 3:06 remaining for a safety, which finished up the 16-point outcome. 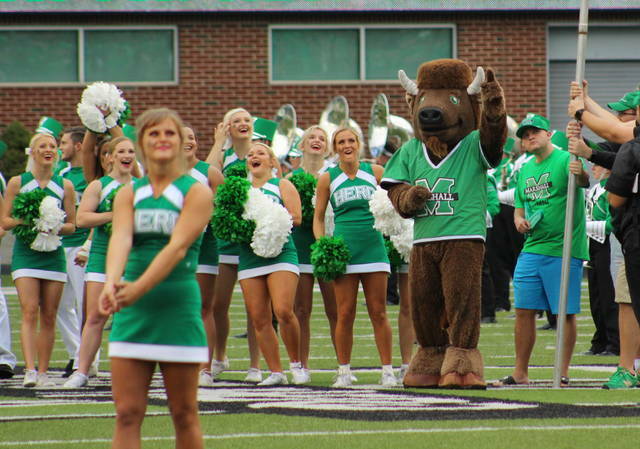 The Thundering Herd claimed a 17-11 edge in first downs and also posted a sizable 278-48 advantage in passing yards, even though the Green and White was outgained 139-89 on the ground. Willie Johnson led MU with two carries for 36 yards, followed by King with 31 yards on 11 attempts. Keion Davis also had a dozen totes for 19 yards. Green finished his first home game under center by going 23-of-39 passing for 278 yards, throwing three TDs and a pick. Brady led the wideouts with six catches for 66 yards, with Xavies Gaines following with three grabs for 60 yards. Davis also had three catches for 14 yards. 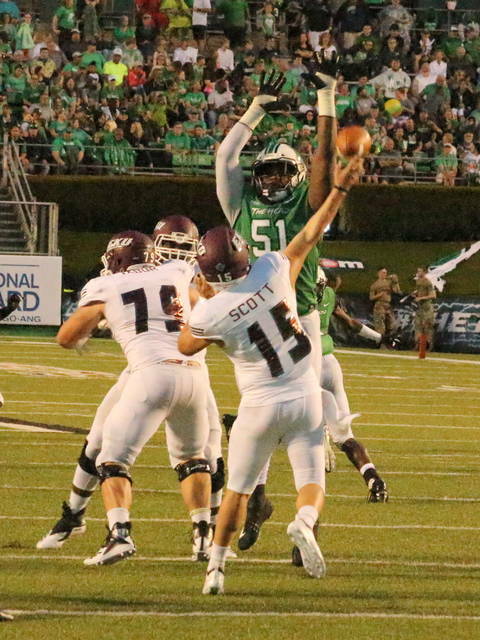 The Marshall defense produced six sacks and three more tackles for loss to go along with its five takeaways. Chase Hancock led the hosts with 12 tackles and Malik Gant added 11 stops. Ty Tyler and Channing Hames each had a team-best two sacks to go along with seven four tackles, respectively. Hernandez, Drayton and McClain-Sapp each recorded their first career interceptions, while Hancock and Tyler each recovered a fumble for the victors. Alphonso Howard led EKU with 64 rushing yards on 13 carries, while Allen completed 5-of-10 passes for 38 yards to pace the guests. Jackson Beerman led the wideouts with two catches for 18 yards. Ben Bascom led the Colonels with 11 total tackles. Alonzo Booth, Jaelin Carter and Matthew Jackson each recovered a fumble in the setback. 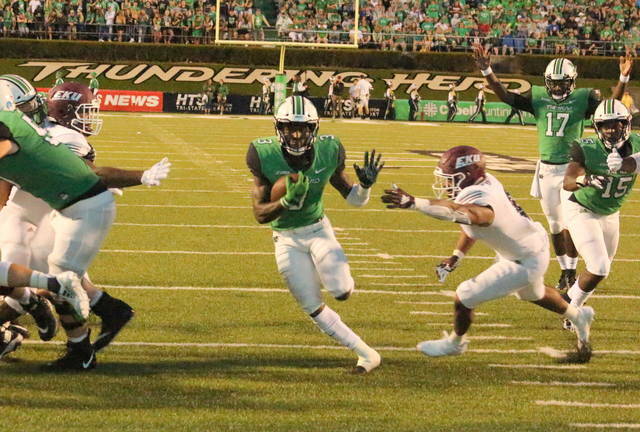 Marshall — which is 2-0 for the first time since the Herd’s Conference USA championship season in 2014 — returns to action Saturday when it travels to the Palmetto State to face the South Carolina Gamecocks in a non-conference contest at 7:30 p.m.